We Review Nottingham's Splendour Festival After Another Sell Out Event. We Review Nottingham’s Splendour Festival After Another Sell Out Event. 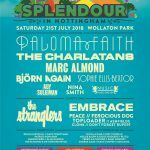 Nottingham’s amazing Splendour Festival took place on the 22nd July and was another huge success. The event was sold out well in advance and this year it indeed proved bigger and better. The incredible line up drew the crowds and even the rain didn’t dampen the spirit of the 25,000 festival goers who attended. The increased security and police presence made everyone feel safe and the atmosphere was super friendly. Children danced along to their favourites and were entertained by circus performers and of course the fun fair. It makes Splendour one of the most family friendly festivals in the midlands. The day started with beautiful sunshine when Georgie took to the Main stage and kicked off the brilliant line up for the day. Gabrielle Aplin sounded amazing before Tony Hadley got the crowds going with Spandau Ballet’s hits. Over on the Confetti stage The Buzzcocks were incredible and started the rock vibe which continued with Black Grape. When the rain started to pour Busted on the Main stage lifted everyone into singalong and were real crowd pleasers. A swift move over to the Confetti stage where Billy Ocean was simply amazing and had everyone dancing in their raincoats. The headliners, Kaiser Chiefs, on the main stage finished the day off perfectly and on a huge high. Ricky Wilson was jumping around the stage and the crowd were doing their best to replicate. The crowd were delighted and it rounded off another superbly successful Splendour Festival.